Plunge: Water descends vertically, losing contact with the bedrock surface. Horsetail: Descending water maintains some contact with bedrock. 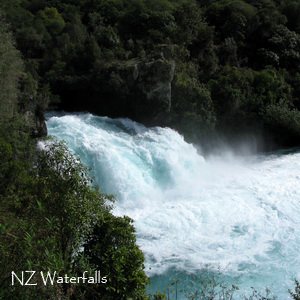 Examples: Ariki Falls, Huka Falls, Okere Falls. 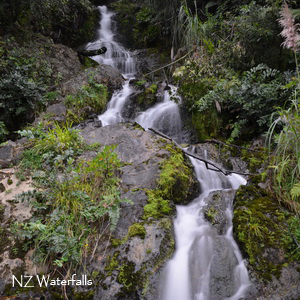 Multi-step: A series of waterfalls one after another of roughly the same size each with its own sunken plunge pool. 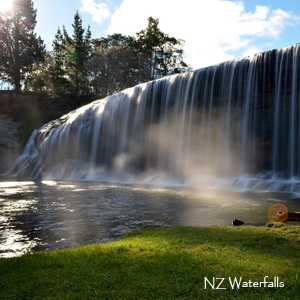 Examples: Kitekite Falls, Wentworth Falls. Block: Water descends from a relatively wide stream or river. 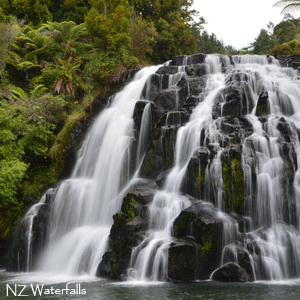 Examples: Haruru Falls, Rere Falls. 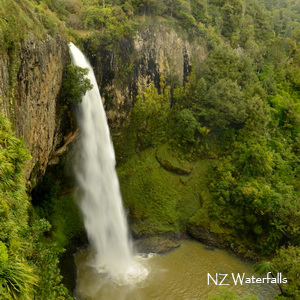 Examples: Wairoa Falls, The Cascade Falls. 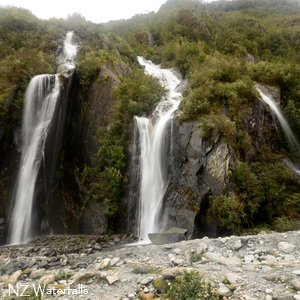 Examples: Hays Creek Falls, Trident Creek Falls. 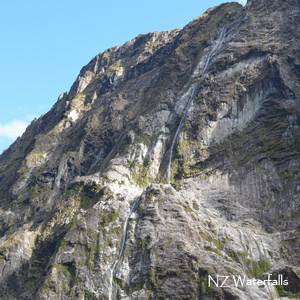 Curtain: Water descends from ledge, taller than it's wide but not a ribbon. 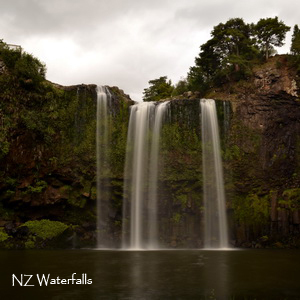 Examples: Rainbow Falls, Whangarei Falls, Mokoroa Falls. Tiered: Water drops in a series of distinct steps or falls. 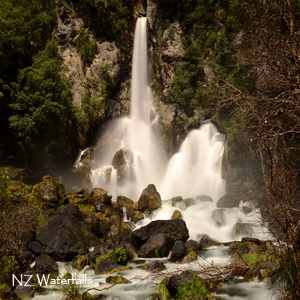 Examples: Tarawera Falls, Purakaunui Falls. 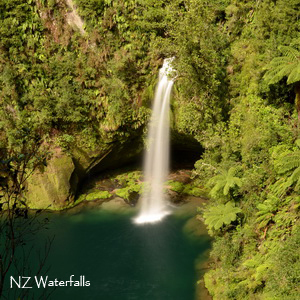 Examples: Bridal Veil Falls, Taranaki Falls, Devil's Punchbowl Falls. 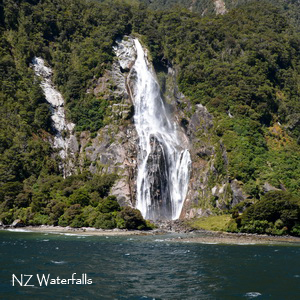 Examples: Owharoa Falls, Marokopa Falls. Glacier: Water descends a series of waterfalls from a glacier. 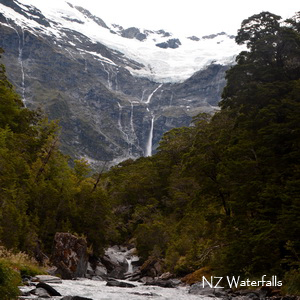 Examples: Rob Roy Falls, Mueller Glacier Falls. Ribbon: Water descends in a narrow strip much taller than it's wide. 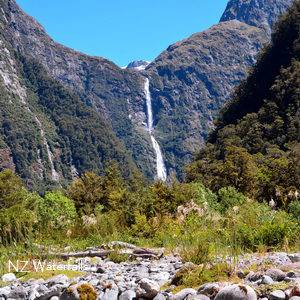 Examples: Fox Glacier Waterfalls, Camera Flat Falls. The article is based on Wikipedia.